The Fifth OC - The Only Bar With a Disneyland View! The Fifth OC – The Only Bar With a Disneyland View! There’s nothing better than relaxing with friends at a bar with a great view! In Orange County, it seems great rooftop bars aren’t super common. So when I heard there was now a rooftop bar in Anaheim with a view of Disneyland, I had to check it out! I recently went to The Fifth OC for their one year anniversary celebration, which sits atop Grand Legacy at the Park, a hotel conveniently right across the street from Disneyland. I immediately fell in love with the venue when I just walked into the hotel lobby, since it had a mural with Walt Disney! Once we went to the rooftop, I was in awe! There was a view of Guardians of the Galaxy: Mission Breakout, which had just opened that weekend, along with Mickey’s Fun Wheel, the Matterhorn, and Space Mountain. The bar & lounge itself is very chic and welcoming, with tables and several comfy couches and fire pits. There’s also a stage where they frequently have live music (you can check out their calendar of what bands are playing here). 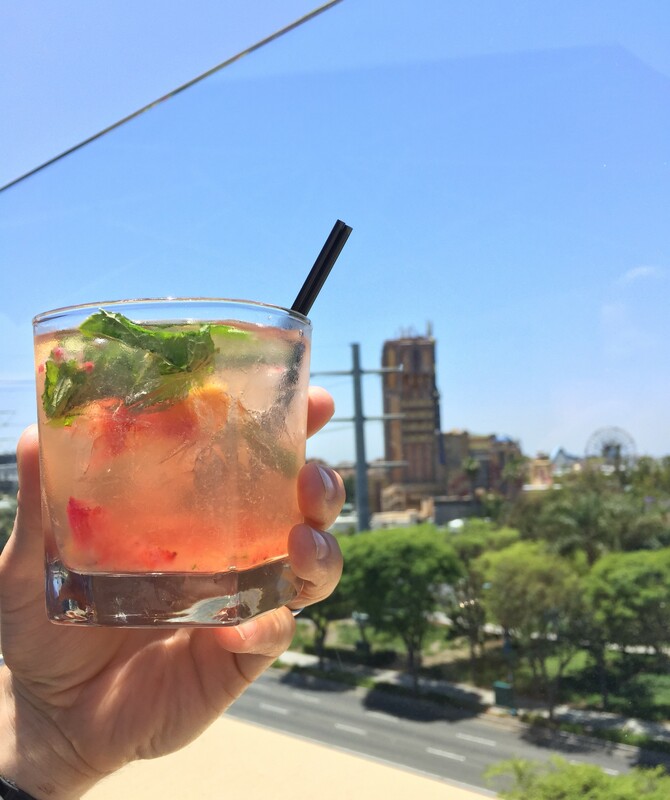 The Fifth OC, being Anaheim’s only rooftop bar, and only bar with a view of Disneyland Resort, is already enough to have me wanting to come here again and again! But on top of it, the food and drinks are stellar! My husband had the shrimp scampi, and I had green bean fries and edamame falafel (which was absolutely incredible). For a cocktail, I asked the bartender to make a tequila and soda with an array of fresh fruits of their choice. It was incredible refreshing, and topped with fresh mint. Now that my hubby and I know about The Fifth OC at Grand Legacy at the Park, it’s definitely going to be our go-to date night spot before or after a trip to Disneyland! Next on our The Fifth OC bucket list: Sip cocktails while watching the Disneyland fireworks! You can learn more about The Fifth OC by visiting their site here.